We’ve been cleaning London’s shop windows for over 50 years. "Professional service from guy's that have pride in their work." As a retail business you need to ensure your shopfront always looks its best. It’s particularly important for any food or catering related business where hygiene is paramount and where goods are on display, be it merchandise or clothing, and for 50 years we’ve been cleaning windows for just about every type there is in Central London. All with no compromise on window cleaning quality and passing the savings directly on to you. Using deionised water and brushes we scrub all signage, walls and framework from the top of the sign to the pavement and one client described it as: "taking the front of the shop through a car wash!”. For multi-storey retail establishments, our full range of equipment is available including Reach & Wash water-fed poles, mobile elevated platforms and rope access – all to provide a professional service at the lowest possible cost. "We have used Gaze-A-Glaze since 2014 and have been very impressed by the high standards of their window and facia cleaning. They have a very personal approach to customer service and really look after their clients." "As a member of LaddersFree for more than 4 years, Gaze A Glaze have now been selected as a Preferred Supplier. 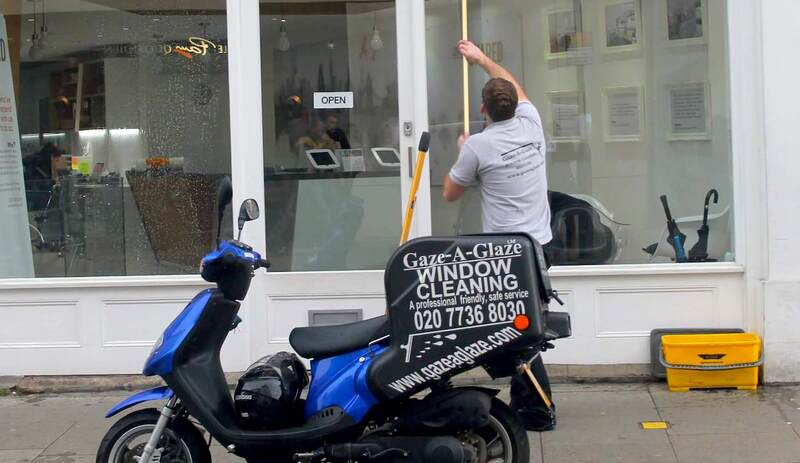 Gaze A Glaze and their team of reliable window cleaners provide regular visits to shops, offices and restaurants across London. Their teams of experienced window cleaners provide an excellent service, establishing Gaze A Glaze as one of the leading independent window cleaning companies in London. LaddersFree are a National Window Cleaning Company with very high expectations from its members. I am pleased to be able to recommend Gaze A Glaze." You can rely on our team of cleaners to work around your schedule and ensure the job is finished to a high quality standard. For retail window cleaning services, contact Gaze A Glaze, Fulham today.